When talking about a leather jacket, what color do you imagine? I’m sure that a large number of people will say black. Lately, the colored leather jackets are becoming a trend; there are hundreds of beautiful colors of the leather jacket to style with your everyday outfit. It doesn’t matter if it is a faux or a real leather, motorcycle or a bomber style attire all can be worn in different colors. You can go for green, blue, burgundy, yellow, camel or the astonishing red leather jacket. Here we will discuss the stylish and sophisticated red color. It is suitable for both men and women, and there are millions of ways to style it out of which few are mentioned below. Once you’ve decided to wear your favorite attire the first thing you need to do is pick a style, here are some of the basic leather outfit styles you can choose from. The motorcycle jacket was first introduced in 1928 by Irving Schott and was made famous by Marlon Brando in the movie ‘The Wild one.’ Since then this specific attire has been used by motorcyclists for protection against road rash. On the other hand, fashion enthusiasts used it as a fashion wear. 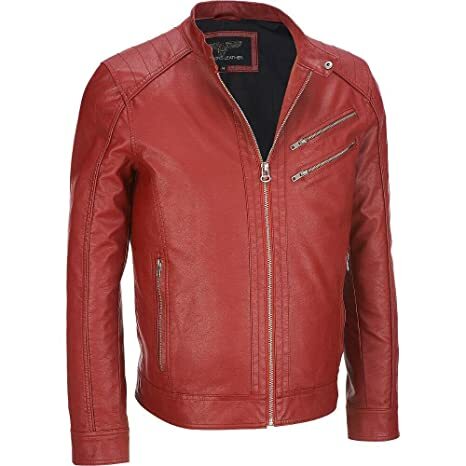 The mens red leather biker jacket outfits are usually slim fitted. This jacket can be the best pick for those guys who have well-maintained body structure. Bomber fashion was used by the military pilots who operated on high altitudes, the mere purpose of this outerwear is to keep them warm, but now the bomber fashion is not only restricted to airforce uniform, anyone can wear it to look great and stay warm at the same time. If you’re a big guy, then this bomber clothing will compliment your physique. The fatigue style outfit descended from the standard military gear; it can easily be identified by its robust shoulder and dual chest pocket. It's a versatile piece of clothing that looks stunning no matter what it’s paired with a shirt and tie or your favorite fancy t-shirt. There are numerous animals used for making leather including exotic ones such as kangaroos, Stingrays, ostriches, crocodile, etc. here we will discuss a few common breeds of leather you might encounter. Cowhide is the most common leather used for the construction of a jacket. It is tough but becomes flexible over time. The cowhide is slightly cheaper than other varieties of leather. If you are planning to buy a durable leather piece, then this should work for you. Goatskin is softer and flexible compared to the cowhide; Goatskin leather wear is an ideal choice for all season, and they age very well. It is one of those leathers that look better the more you use it. Goatskin was utilized by the military to make the evergreen A-2 and G-1 pattern attire which is still highly in demand. Calfskin is soft and pricey it is fairly durable and does not show scratch and blemishes quickly. Calfskin is typically used for constructing shoes, whereas it is less commonly used for making jackets. Calfskin outfits provide warmth in cold weather while still being suitable enough for the spring season. Lambskin is exceptionally smooth and delicate which means it is prone to tearing and damages. However, it is lightweight and very comfortable. Lambskin attire is significant enough to wear all year long. Faux Leather is made up of synthetic materials which make it relatively cheaper as compared to the genuine leather. PU leather outfits are only meant to give you style; it offers little to no protection from road rash. Faux leather is good for vegans or for the people who want to look good at a low price. By now you know a lot of things about the leather jacket like the styles and the type of skin used. Here are some tips on how to wear it. The mens red leather motorcycle jackets are the best option if you want to acquire a rocker style. It is not important to be a motorcyclist to wear this type of attire, anyone who finds it attractive can wear it. While wearing your favorite color attire avoid gaudy colored shirts, go for colors that can work as a background for your outer like black blue or white. Whether it’s a movie, date or dinner, you need to dress up- smartly, so to give you casual outfit a dressed up look you can add a dark scarlet pattern outfit. 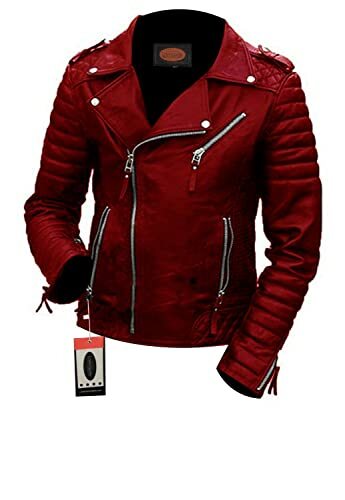 This style of mens dark red leather jackets are perfect for such occasions; you don’t have the risk of being over dressed or under dressed in this outfit. It is not necessary to wear the completely red fashion gear you can try something different like this black and red leather motorcycle jacket which has a complete old school look to it. If you want to dress up in the vintage style, this one is for you. The dark red jacket looks ideal when worn with a printed top, styled with skinny blue jeans. Complete the look by adding a matching bracelet and belt. Women can also look fabulous with the red biker jacket style; pair it with a striped top, and a flared black and white printed skirt and you’re ready with an amazing outfit. Here are some of the most trending red leather clothing collections that every man and woman must try. 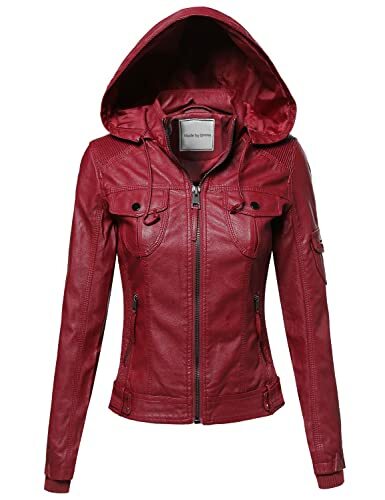 This stylish ladies red jacket is something unique and attractive. It gives you perfect fitting and is adjustable on any style. You can make this outfit as daily wear attire. Moreover, you can don it casually and also in party nights. Crafted from real leather and available in a distressed shade, this is another staggering jacket that would make you look absorbing. It's equally suitable to be worn by women bikers as well. This finely made red leather jacket outfit has a zipper for closure on the front along with four outside pockets to keep your valuables. 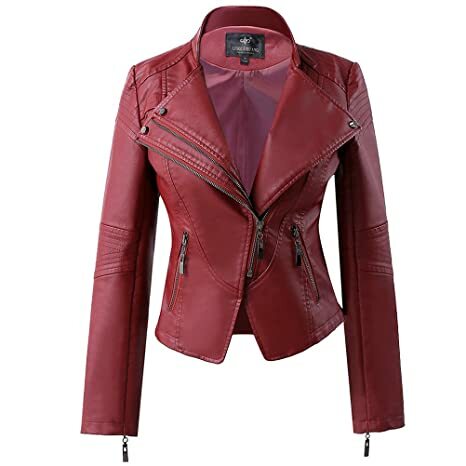 If you want to add an attractive look or a biker style then you need to try this red faux leather Jacket. The finely crafted attire includes viscose lining inside; padded stitching is applied on the shoulders to enhance its outlook which makes it a perfect choice for outings, casual gatherings, and parties. 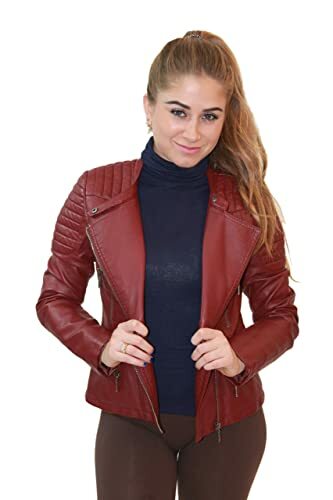 This fantabulously designed red moto jacket women's a perfect choice for all the teenage girls who want a swag in their style, plus it's an ideal pick for all the bike riding women. Well, it's an attractive masterpiece that fulfills your casual fashion needs. This attractive yet stylish rider style fashion wear is not only a moto style but can be used for daily wear use. You can don this leather piece on outings, in colleges and universities and on dates. Have a look at red real leather attire that is yet another perfect edition that gives you style plus protection against the cold. You can wear it with your regular clothes such as tops, shirts, and pants. Not only it fits well on your skin, but make you look fabulous among your friends. If you are looking for that ideal outfit that you can wear with almost all of your shirts, pant and jeans then here is the real leather jacket. It's one of the best clothing for casual wear that you can also wear for winters as well as hanging out with friends and family. It's a must have outfit in your collection. There are many male bikers out there who are preferring red leather jacket. Here is the best choice for you that would not only give you remarkable appearance but it is made to make you relaxed and comfy while biking. You can close the front zip as per your needs. Even non-bikers would love to don it. This slim fit style biker edition is an ideal choice for all teenage boys who have slim fit body structure. It will look nice on you when you carry this outfit casually, in restaurants, and in friends hangouts and college parties. This attractive style lambskin leather moto style outerwear is another fantastic edition that adds perfection to your outlook. It will keep you comfortable while riding a bike. Plus it's a perfect choice for the winter season. Made from PU leather, this classy design moto style outfit for men is an elegant edition for you. It's an outclass attire that fulfills your fashion needs. Whether you want to enhance your bike riding style or want to wear it casually or want to add something new to your daily look, then this masterpiece is a perfect choice for you. This updated men's fashion attire is a class apart edition. Crafted with perfection, the complete masterpiece offers a new and refreshing look. Plus the belted collar look and buckle lock closure in the front made it look dashing. It's a kind of a deal that you never want to miss for sure. To Sum-up, it can be said that it is always good to try something new like the dark red leather jacket; it shows how much effort a person makes to dress up and remain updated with the latest trends.